Free food is wonderful, especially free meat. Carla snapped up a bunch of free pork through our farm share, which would have otherwise just been thrown away. She got me a pig's head, liver, heart, caul fat, back fat, and several feet, ears, and tails. We only had to pay for the organs and fat, since they were they only thing that required a labor fee for some basic cleaning. The first thing I decided to try was the tails. When it comes to cooking a new piece of offal, I usually turn to Fergus Henderson, who carries the torch for so many cooks who practice "nose to tail" eating. That was also the name of his first cookbook. 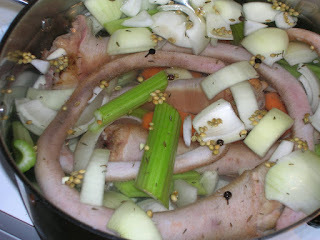 For pig tails, he recommended braising them into tender submission, rolling them in mustard and bread crumbs, then roasting for crispy results. But before any of that I would need to clean the tails. Fergus recommends a disposable razor for shaving off the hair you'll naturally find on the pig. I've only shaved a pig once before, when I bought two baby pig heads from a farm in Quebec. These Pennsylvanian pigs tend to be a bit on the bristly side, quickly clogging my razor before I had cleaned an inch. Thinking of alternate solutions, I remember reading about a Baltic tradition of killing a pig on a small pile of dry brush. You then light the brush on fire, which burns the hair off and cooks the ears, which are given to the children as a chewy treat. What's sad is that I honestly did read about this, while surfing the internet on my lunch break a few years ago. Being January, it's freezing outside and lighting up the grill wasn't a good option. So I poured the culinary equivalent of liquid napalm on the tails: Stroh. Stroh is a 160 proof Austrian rum. Being 80% alcohol, it's not much of a quaffable spirit, but a necessary ingredient for Austrian fried pancakes. One bottle will last you a lifetime at the minimum. Doused in booze, I lit up the tails on my porch until all the hair was scorched off and I could no longer smell burning pig hair. Since my one disposable razor was irrevocably clogged, I slipped a new razor cartridge into Carla's Schick and sheared off the tiny nubs that remained. Two thorough scrubbings later, the pig tails were ready for the pot. I braised them for about four hours in water and basic stock vegetables until I could easily nip off a piece of skin with a fork. Chilled overnight, the morning held great promise. To make them crispy Fergus recommends a basic bread coating. 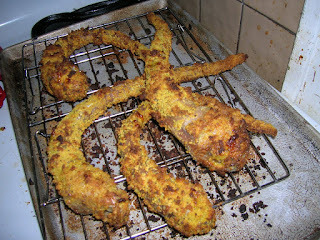 Roll the tails in flour, dip in a mustard-heavy egg wash, then roll in bread crumbs. Where we differ is that Fergus crisped the tails in a buttered skillet, then finished them in a 425 F oven. Along with having nearly-indestructible hair, my tails were also super-sized. I didn't think I could easily fit the tails in anything but my griddle, so I decided to bake them a bit longer in the oven to get the crispy texture. And they were crispy! 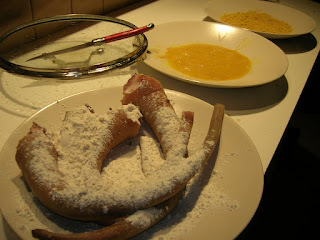 To be honest, I don't mind the prep work these tails required, as the results were very tasty. Plus I feel good that this animal's meat did not go to waste. 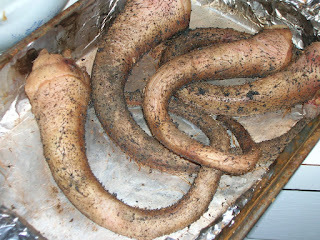 Beneath the crispy coating, the tails had the unctuous taste and texture of cotechino sausage. If that description doesn't help, it was 30% meat, 30% fat, 30% skin, and 10% crust. Very porky, with a lip-smacking richness that coated your mouth with the pig's natural gelatin. I prefer the smaller tails, as the larger ones just got fattier, not meatier. If I were to do these again, I would try deep frying them to make the skin naturally crisp and not bother with a coating.